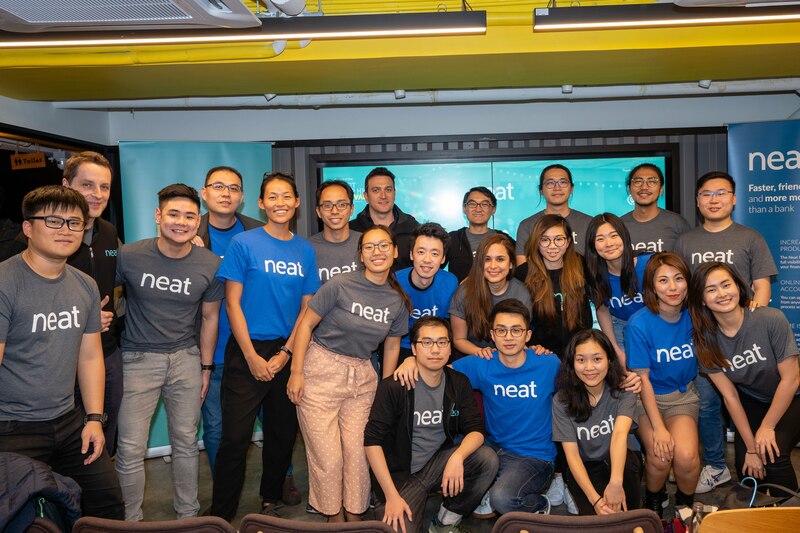 Last week we were incredibly excited to host our first ever #NeatCommunity event, in partnership with the StartmeupHK festival 2019! We were floored by the magnificent turn out and we were so happy to meet everybody that came! What is the #NeatCommunity Meetup series? When we’re wearing our Neat t-shirts on the street, Neat users are always approaching us and telling us how much they’re loving our product, and how it’s changed so much of how they do business. 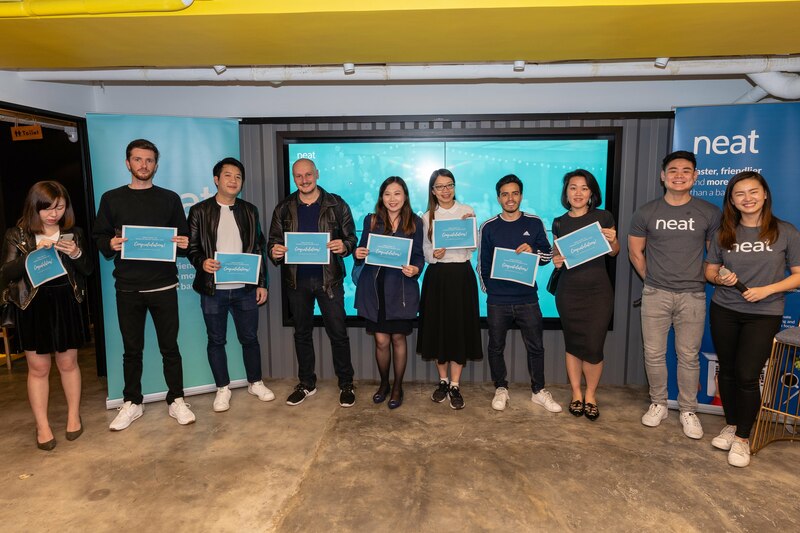 The #NeatCommunity Meetup series is created with the purpose of connecting the Neat user community, as well as other like-minded entrepreneurs in Hong Kong's vibrant startup ecosystem. At these events, we will bring on stage industry experts and community leaders, as well as entrepreneurs to share their insights and success stories. Our MCs Josh and Natalie opening up the evening. For our first meetup, we turned our focus on the food and beverage industry. 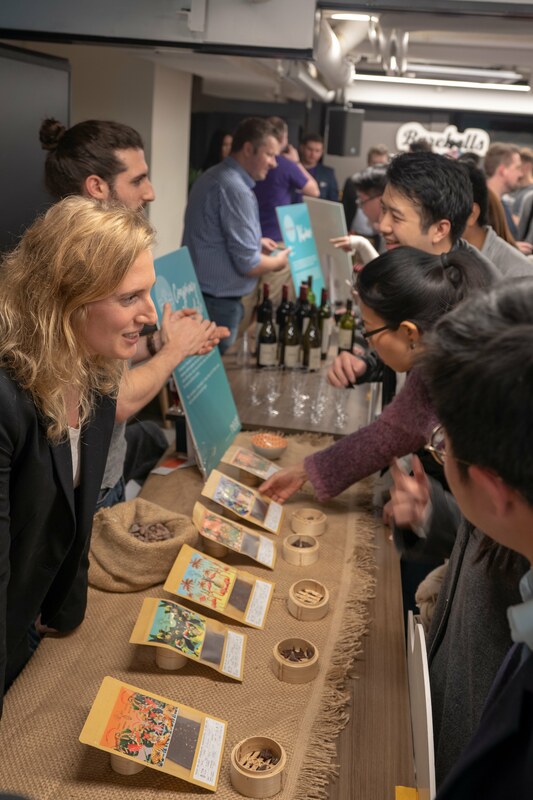 That night we were so happy to have customers and friends who were innovators in the food and beverage scene come and exhibit in our marketplace. Vivino is the world’s most popular wine community and most downloaded mobile wine app. They chose some great reds to share with everyone that night! Barebells makes protein enriched snacks, for people who want to indulge their cravings guilt-free. Everyone at the event got to sample a variety of their shakes and (delicious) protein bars. BistroChat is a reservations app that allows you to directly chat with restaurants. Thanks sharing the delicious wine and cheese! FB Solution Hong Kong imports and distributes French bakery products across Hong Kong, Macau, China and Taiwan. Everyone enjoyed their breads, pastries, and petit fours that night. Conspiracy Chocolate is a small batch bean-to-bar craft chocolate company, who make dark, naturally vegan chocolate in Hong Kong with Vietnamese cacao. We all tasted their different chocolates, which included out-of-the-box flavours such as Sichuan pepper and Jaffa. Wine Moments HK is an online shop and distributor of wines and spirits, perfect for any moment. They brought a curated variety of gin for us to sample (plus tonic water to mix!). Drip, the third cafe by Social Club, who provided some flavoured beers from their Garage Academy location. Dalal Alghawas, Program Manager of Brinc, a Food Technology Accelerator, also joined us that night to share more about trends in the evolving food technology scene. 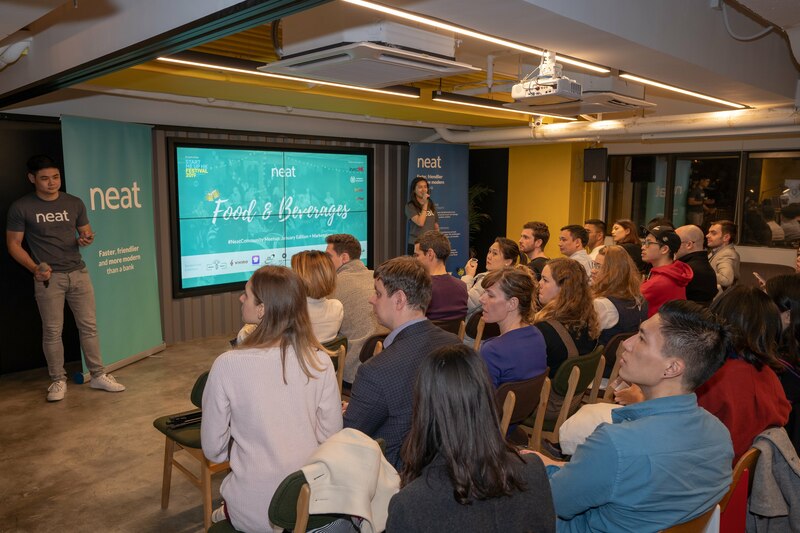 We also got a chance to hear from the companies in their first cohort – True Nosh, Hakko Bako, Grounded, Fat Baby – about how each of their burgeoning companies are changing how we think about food. Then we invited three entrepreneurs (who are also Neat Business customers!) to join a fireside Chat on starting up their businesses, growing, and finding their niches, facilitated by Neat’s very own Iris ten Teije. 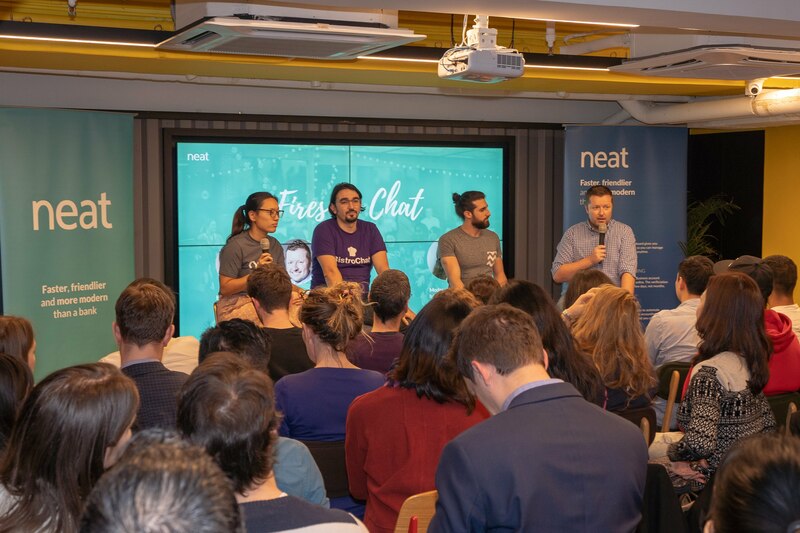 Featured from left to right are Iris ten Teije, Growth Hacker of Neat; Hecene Taibi, Co-founder and CEO of BistroChat; Amit Oz, Co-founder of Conspiracy Chocolate; and Morten Fillipsen, VP and Head of Vivino Asia. Phew! We packed a lot into the evening, and ended the night with a lucky raffle! 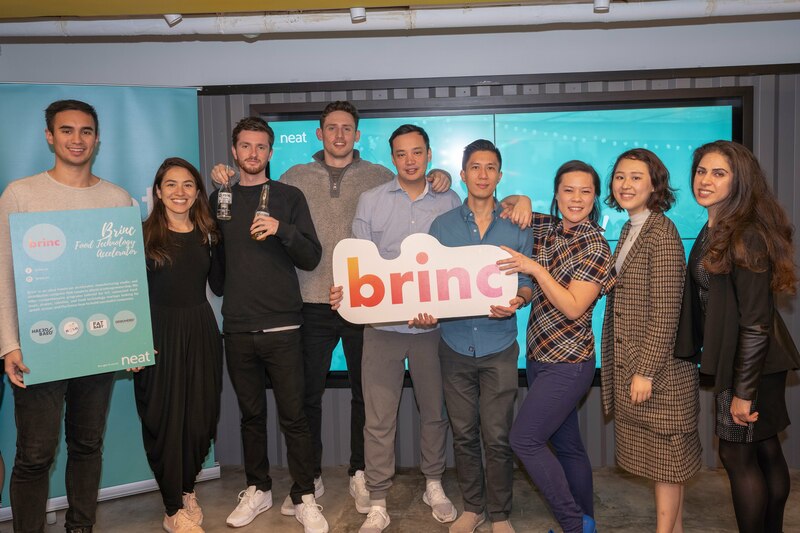 Again, we want to give a huge shoutout to Garage Academy for providing an amazing space for this event, as well as InvestHK, WHub and Brinc for helping us make this happen. 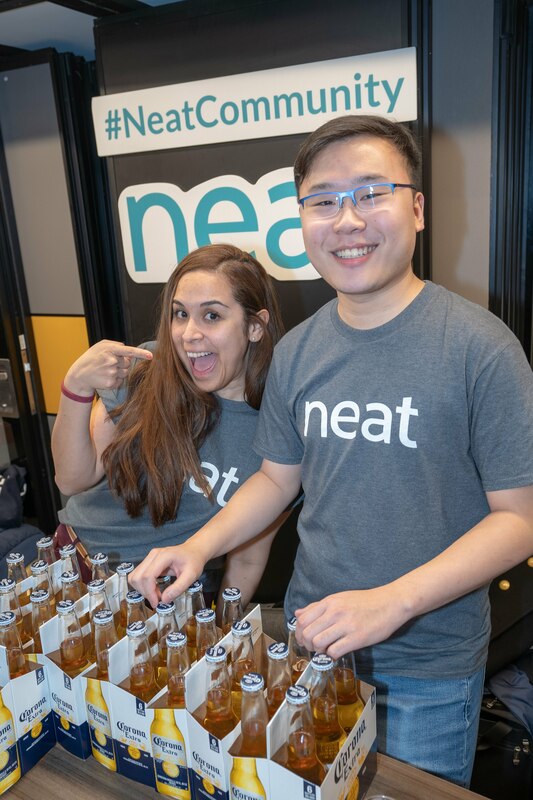 If you’re interested in partnering or sponsoring our next community event, please email us at community@neat.hk. We would love to hear from you! Will we see you at the next #NeatCommunity event? Learn and get inspired. Each time we will present a different theme where we invite industry experts and active players to share valuable insights. Share on stage. Stage time for Neat users to share what they do. Grow your network. Mingle with experts, founders, service providers and potential hires. Be a part of a community that inspires and supports each other! Meet the team. Come chat with the Neat team, ask us questions, and talk to us about what it’s like to work here. Socialize & chill out. We always have amazing food and drinks! Join our newsletter and follow us on social media to stay in the loop for the details on next month’s meetup.